Here is my star for this week's Fussy Friday Star sew along with Temecula Quilt Blog. Here is the fabric that I used for this one. Thank you for all of your nice comments and emails about my Fussy Cutting Tutorial. I've added a link to it in my sidebar as well as a tab at the top under my blog header. Hope you are finding some time to stitch. I've received several emails and comments asking how I make my fussy cut diamonds and how I choose fabrics. This is a tutorial to show you the fabrics I've used in my six pointed stars so far, how I fussy cut them, and a little bit about what fabrics I use. Below is Hope Chest by Edyta Sitar (Laundry Basket Quilts) for Moda. I really like this fabric. I've used it in my Soupcon block, a Lucy Boston Patchwork of the Crosses, a Road 66 Hexagon from the book Primarily Quilts by Di Ford, and the 6 pointed diamond from the sew along at Temecula Quilt Company. The brown star (bottom left) is cut from this same fabric but a different color way and a different place on the fabric. The fabric in the next two photos is from the line Romantic Olde Charleston by Judie Rothermel for Marcus fabric. The one below is Judie Rothermel's 25th Anniversary line. My fussy cut snowman Soupcon block is from Share The Joy by Deb Strain for Moda. The piece on the left is Paint Box by Laundry Basket Quilts for Moda. That piece is good for hexagons and Lucy Boston, but I don't think there is enough going on in the fabric for a diamond. The piece on the right is Old Glory by Nancy Gere for Windham fabrics. I would make a diamond out of that one because of all the movement in the fabric. This is what I use to make my 6 pointed diamonds. I have tried using the mirror and the plastic templates that are available and the 28 mm rotary cutter, but I honestly do better at matching diamonds and hexagons with my homemade window template, a marker and a pair of scissors. The window template is just made using an index card. I trace the shape of one of the paper pieces and then add between 1/4" and 3/8" and cut out the center. When I'm happy with what I see in the window of the template, I trace around the edge with the marker and cut it out with scissors. It makes great TV work when I'm too tired to stitch. When I choose where to cut my fabric, I am most concerned with the two points where I've drawn the arrows (below) and the area in between. If I'm using a stripe, I try to make it cross the diamond at and/or just below that top arrow where it will join with the next piece. At the bottom arrow I try to find "something" in the fabric that will make an interesting design where the points meet. I try to have a different color in the center to draw your eye there. And, to be honest it hides the stitches that are there because it's not always easy to get those 6 points to meet. Also I try to make sure that there is something dark at the very top point because the chances are pretty high that I will use a light colored background fabric to set the diamonds. If my outside points are really light or white, the points will get lost in the background. Below is one of the diamonds I showed in my last post along with the fabric and the window template on the fabric where it was cut. The fabric is Ruby by Timeless Treasures. I ended up getting half of each of the petals in the design so it made the diamond look like it had a big flower in the center. In the bottom I centered (or tried to center) that little brown diamond right in the bottom so it would look like the flower had a center. Most of what I've used so far is from my stash. Below are some fabrics that I bought at Back Door Quilts in a bundle. They have used these same fabrics for fussy cutting in a Sue Daley quilt that they are working on. I really love this bundle, and after I started looking at it I figured out why. I had about a third of the fabrics already in my stash. You can see the full bundle in my post here. The fabrics below are great, but you can see that the print/design in them is too repetitive, and they would not be good for fussy cutting. Here is the window template placed on 6 different motifs in the fabric shown in the photo below. By placing the template at this point on the fabric I ended up with this star. And, by choosing a different place in the fabric, I ended up with a totally different star. With both of these stars I have a dark point at the top and a little something in the very bottom point to create a center. I have parts of the orange flower petals on both sides of the diamond even though they don't quite meet in the star. Here is how I cut the star from a striped fabric. I made sure the very top wasn't on the light stripe, I put the black part of the stripe at the middle of the diamond and that little white motif with the red dot in the bottom. Here is the same fabric used in one of my Road 66 hexagons. When I do the inside 6 round of a hexagon, the fussy cutting is the same as for a diamond. If you fussy cut that round, you line your design on the edge that connects to the next hexagon. But, the second and subsequent rounds have to be cut differently. If you look at the hexagon where I've measured, there is one way that it is longer than the other. On the second round every other hexagon is turned differently. I've shown that by making two templates and marking the long sides (points) with dots. I've drawn arrows where the design for fussy cutting has to be placed. You would cut 6 of both hexagons. 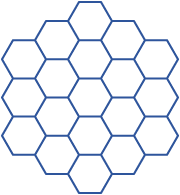 The hexagon is a tessellation, but as you can see in the diagram you have to turn every other piece a different direction to create a fussy cut design on the second round. The third round would be (starting at the top) one from the pink template and 2 from the green template. A hexagon quilt is like the tumbler or apple core quilt. They all make a charm quilt, but the pieces have to be turned different directions to fit together. Even when I fussy cut a circular, oval or floral design, I still cut half of my hexagons one way and half the other. This fabric is Civil War Melodies by Judie Rothermel. Here are more of my Road 66 hexagons with different rounds that are fussy cut. I hope you are finding some time to stitch today. 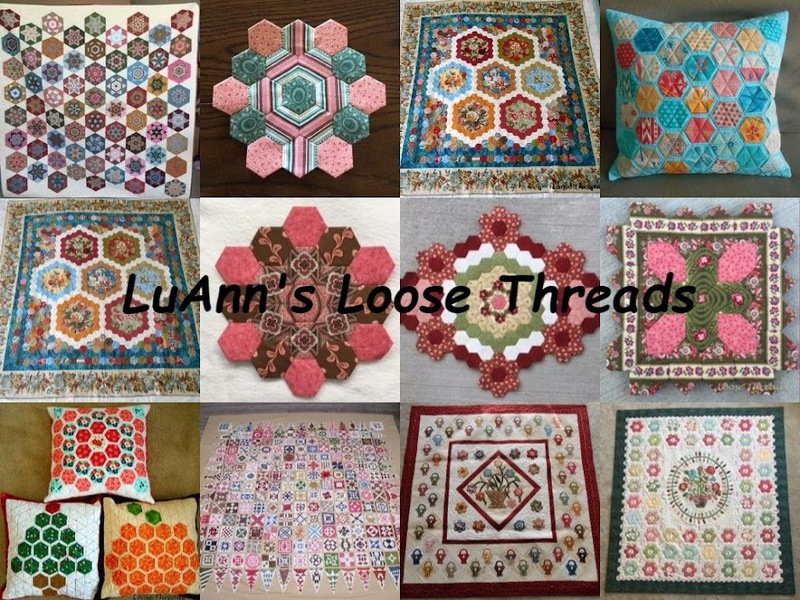 It's another Fussy Cut Friday over at Temecula Quilt Company blog. Sheryl is having a year long sew along where we make one 6 pointed star each week. It's a mystery really because we won't know how these stars will be set together until the end of the sew along. The stars are 2 inches on a side. My quilt will be scrappy, and I love making these fussy cut stars. I've completed my Benjamin Biggs Block 2. Benjamin Biggs is a free BOM offered by Gay at sentimentalstitches.net and Brenda at dearjane.com . Then there is block number 1. I was trimming my blocks to take blog photos. If you take a look at the bottom right corner of block 1 below, that isn't a thread. I trimmed it 2 inches short. If you follow the imaginary line up the side of the block, it is going to be too close to use in my quilt. I could just log cabin more fabric on all 4 sides just like Jane Stickle did in the original Dear Jane quilt, but I couldn't leave well enough alone. I tried using my seam ripper to selvage that red fabric I wanted to use. That was working out fine when I noticed that the red had faded onto the background fabric when I sprayed it with water to remove my placement lines. So I've started again. After stitching on it last night, I think that fabric is too thin and it is fraying like crazy, so I am going to prep another block and start over again. I've reduced my blocks to 75%. I also did block number 1 in the full size. Yesterday was a crazy weather day. The sun was out until early afternoon. Then we had sleet and freezing rain and a little snow. Today it is in the 40s and things are starting to melt. Hope you are finding some time to stitch today! My Dear Jane quilt is finished! I worked on the blocks and triangles off and on for 10 years or so. The top was finished almost 2 years ago. I had planned to hand quilt it, but I decided to send it to long arm quilter, Jennifer Cunningham who lives here in Indianapolis. I think she did a beautiful job custom quilting it on her long arm machine. I love how she turned every other feather design the opposite direction. I did my quilt exactly like the original quilt made by Jane Stickle in 1863 except that I curved my corners a little differently. The patterns were drafted and published by Brenda Papadakis in the book Dear Jane. I followed the directions by Linda Franz to finish and bind my scallops. I love that the center block is called Indianapolis. You can see by the photo that I have always liked to fussy cut fabric. When the outside photos were taken, it was 13 degrees. I checked to make sure that the snow was really frozen before I put the quilt on top of it. So I have a finish for 2014!!! Have you been sewing along with the Soupcon Sew Along over at Faeries and Fibres blog? I saw one of these embellished English paper pieced blocks on several blogs, so I decided to go and check it out. The finished quilt/wall hanging will be approximately 33", and there are only 6 clues. This is my first block. While I was searching my stash, I found this snowman print fabric and decided that I would make a second block. I am a clue behind. The next step has a circle that surrounds the block, and that is appliqued to a background square. Here are my possibilities for both blocks.